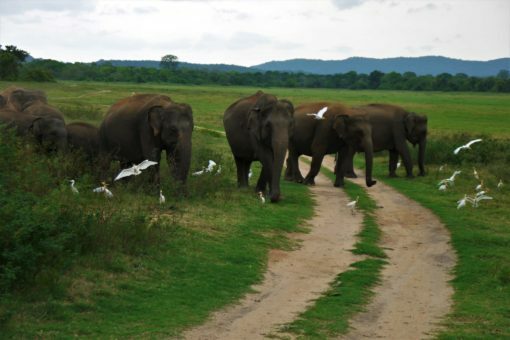 Sri Lanka – land of tea plantations, powdery beaches, elephants and UNESCO-listed ruins. We loved our brief, two-week delve into the Teardrop of India in 2017. It was the perfect place to heal after our intense trek to Everest Base Camp in Nepal and we were astounded by the incredibly friendly people we met. We’d love to return to this beautiful island, here’s why I think Sri Lanka is the perfect holiday destination. The smiling official in Colombo gave us the warmest airport welcome we’ve ever experienced and this was a sign of things to come. Everywhere we went in Sri Lanka we were met with smiles, children waving to us on their way to school and locals offering us help. 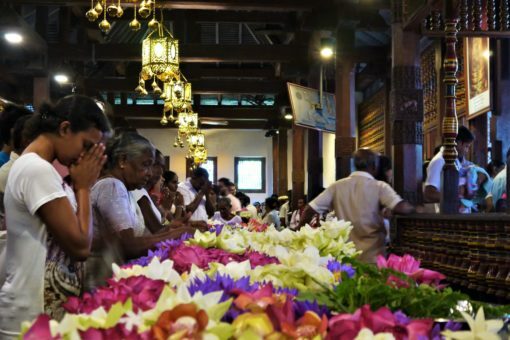 We we truly welcome in Sri Lanka, a country that felt far less touristy than other Asian destinations we’ve visited. So, what did we see on our two-week Sri Lanka trip? 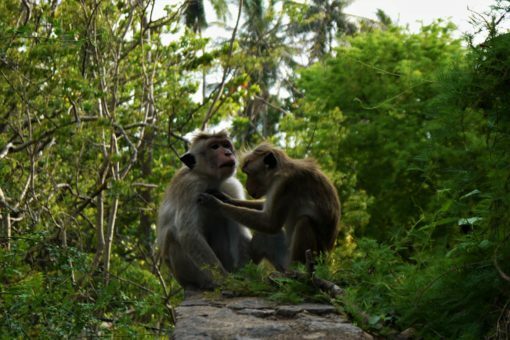 From Colombo, we headed north to the heart of the country for a stay in the jungle at Diyabubula, complete with cheeky macaques. 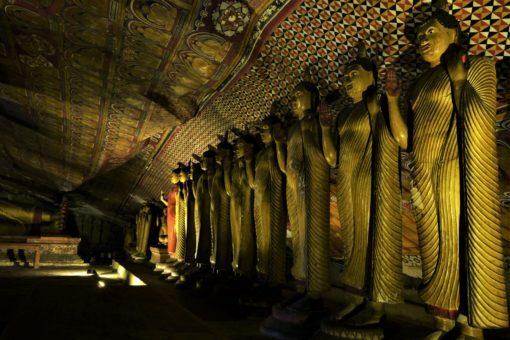 We visited UNESCO sites like the Dambulla Cave Temples which were filled with elaborate murals and climbed up Sigiriya, otherwise known as Lion Rock. 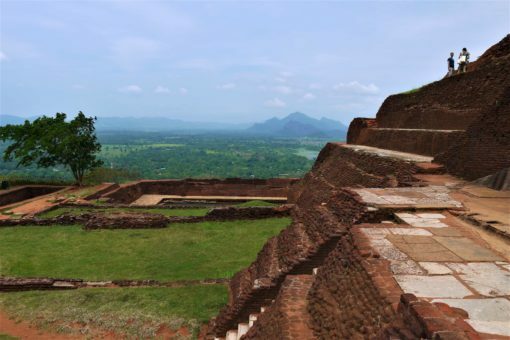 There were more UNESCO temple ruins at our next stop, Polonnaruwa, part of Sri Lanka’s fascinating cultural triangle. We spent a day in nearby Kaudulla National Park on a safari through forests and sweeping grassy plains. As we bumped along, we spotted all kinds of incredible wildlife, the highlight was a huge parade of elephants, complete with babies. Our next stop was Kandy, Sri Lanka’s second-largest city, which is surrounded by green mountains. 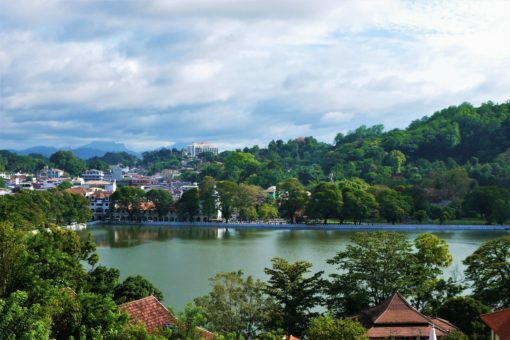 At its centre, there’s a glistening lake and ornate royal palace complex home to the Temple of the Sacred Tooth Relic, where one of the Lord Buddha’s teeth is enshrined. We spent our time in the city wandered around colourful local markets and watched a Kandyan dance show. 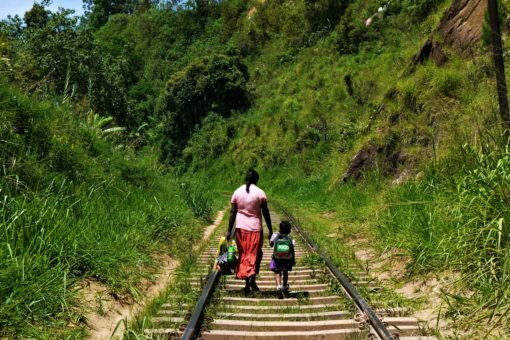 One of our Sri Lanka highlights was the scenic train journey from Kandy up to the peaceful mountain retreat, Ella. 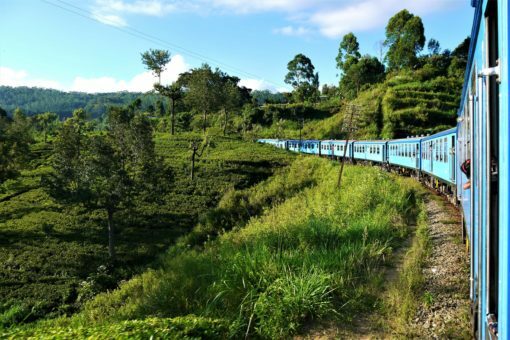 With the windows thrown open, the train wove through lush, lime-green tea plantations with mountain backdrops and unspoiled countryside. We travelled over huge stone viaducts and stopped in tiny local train stations. Ella was a beautiful place for us to spend our final days in Sri Lanka. We stayed just outside of the town, which is really more of a village, in a forest filled with monkeys. Every day, we watched them play while we ate the most delicious watermelon and rice hoppers for breakfast, then headed out on stunning hikes to Little Adam’s Peak and Ella Rock. Is Sri Lanka the perfect place for a holiday? Size – the UK is about four times bigger than Sri Lanka, which gives you an idea of how small and manageable Sri Lanka is. 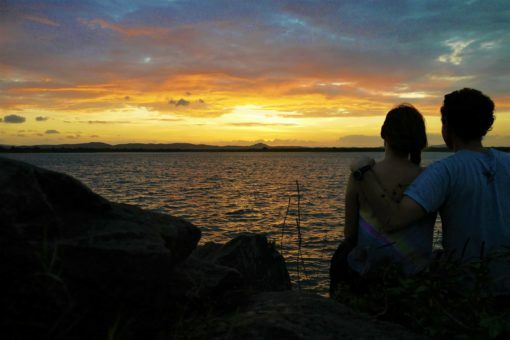 All the country’s top sights are easily accessible by train, bus or car, making this an easy destination to explore. 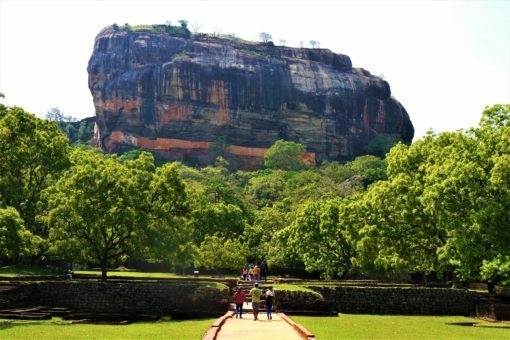 Diverse scenery – Sri Lanka truly does have everything, from beaches to cities, forests to mountains, tea plantations to safari parks. That’s not to mention the ancient ruins, colonial towns and colourful local villages. Friendly people – Sri Lanka has some of the friendliest, most welcoming people we’ve met on our travels to date. Stunning wildlife – the country boasts some incredible wildlife, from exotic birds to sloth bears, leopards and monkeys. Although the elephant population has dropped dramatically to just over 2,000, conservation efforts are underway and it’s still easy to spot these gentle giants in national parks like Yala and Kandulla. Everywhere we went in Sri Lanka we saw macaques but unlike elsewhere in Asia, they hadn’t become desensitised to humans and were still wild enough to keep their distance. 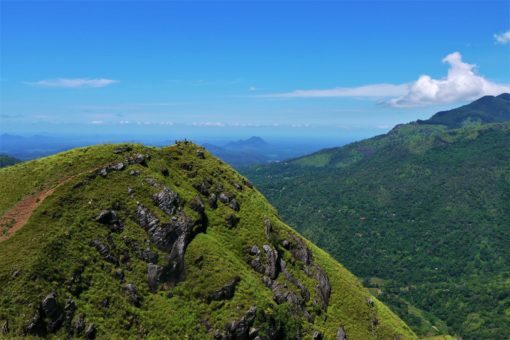 Affordability – sure, the flights out to Sri Lanka can be expensive depending on where you’re coming from but once you arrive, it’s very affordable. A six-hour, first-class train journey cost us just £7 each and you can bag luxury accommodation at reasonable prices. We found the food was great for vegetarians and vegans, with a huge meal costing just a few pounds. Not too touristy – in contrast to other Asian destinations we’ve visited, Sri Lanka was one of the least touristy, which made for a peaceful travel experience. We weren’t hassled by touts or ripped off by over-priced tour companies. Where to visit and stay in Sri Lanka? We visited Sri Lanka in June, but I’ve heard that it’s also a great winter sun destination. Now we’re based in Europe, I’d love to take a trip to the southern part of Sri Lanka in December, which offers great beach weather. This is an area we didn’t really explore on our last trip so we’d base ourselves somewhere on the coast. Since we don’t travel on such a strict budget these days, we’d definitely indulge in a beautiful villa with a pool. We’ve really enjoyed recent villa holidays with family in Europe, they’re great for larger groups or for private, romantic breaks. Sri Lanka Villas has some great options and we love the fact that the company plants a tree in Sumatra for every booking they receive. We’d probably opt for a villa near Mirissa, one of Sri Lanka’s top beach destinations with golden sands, palm trees and turquoise waters. December is whale watching season, with a high chance of spotting Blue and Sperm Whales, there’s also a nearby Turtle Conservation Project at Rekawa Beach that we’d love to visit. Andrew could try a spot of surfing in the gentle waves and there are some reefs for snorkelling off Polhena Beach. Just along the coast from Mirissa, we’d also visit the historic port Galle which is a UNESCO World Heritage Site. This former Dutch settlement has a fort at its centre that dates back to 1755 and is filled with red-roofed colonial buildings. Other great destinations on Sri Lanka’s southern coast include Tangalle, with its wide beach and the quieter Weligama. 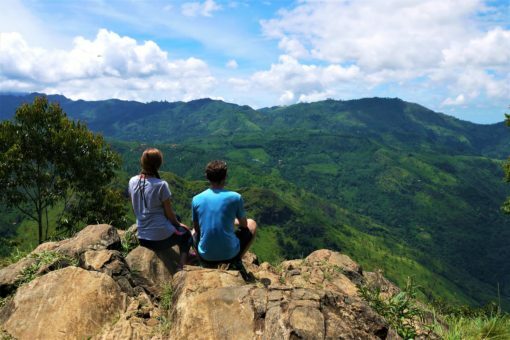 At the moment, we’re thinking December 2019 could be the ideal time to return to Sri Lanka. What do you think? Have you been?